If you’re tired of trawling the mall on the hunt for your favourite beauty buys, we hear you. Most of the time, finding that must-have product that everyone is recommending is near on impossible. Plus, with Black Friday happening this month – the thought of battling fellow shoppers is tiring, and we’d much rather shop from the comfort of our own sofa in our pyjamas. So what if we told you there’s a new beauty haven now serving the UAE? The perfect go-to site for all of your beauty, hair and skincare needs. With localised offers and campaigns tailored for the UAE’s beauty lovers, Lookfantastic is a growing brand in the country – and it’s rapidly gaining popularity. That’s no surprise though, as Lookfantastic has a huge international presence as one of the leading beauty retailors in the world. Plus, they offer the widest selection of skincare and haircare products to choose from, all at THE best prices you can find online. Still not convinced? On top of the already brilliant discounts, this Black Friday Lookfantastic are giving EXTRA discounts - all you have to do is use the discount codes below when shopping online. Here’s 6 Black Friday deals from Lookfantastic that will surely sway you to enjoy a beauty splurge! This innovative beauty brand has become increasingly popular over recent years with beauty lovers and the skincare-obsessed. They're best known for using cutting-edge ingredients to help smooth, firm, hydrate and tighten your skin. For Black Friday 2018, you can avail 50% off NIP + FAB products on Lookfantastic... PLUS remember to use the code CYBERX5 and enjoy an extra 5% off! Created by London's most sought-after facialist, Sarah Chapman is a premier skincare brand that offers bespoke treatments and products perfect for tailoring a regime that meets your individual needs. This November, you can enjoy 30% off her renowned Skinesis skincare range on Lookfantastic for Black Friday. Or apply an additional 35% OFF your basket filled with Sarah Chapman products by using the code CYBERX35 on Lookfantastic. With a legacy that dates back to 1912, Shea Moisture aims to provide the best in personal care and beauty - and you can enjoy their compromise-free products this Black Friday with 40% off when buying your must-haves from Lookfantastic. Not only that but the site is offering an EXTRA 5% off Shea Moisture products if you use the code CYBERX5 this weekend... So you can save up to 45% off Shea Moisture products in total! Promising first-class care for effective anti-ageing, Filorga specialise in the development of high-quality care products. 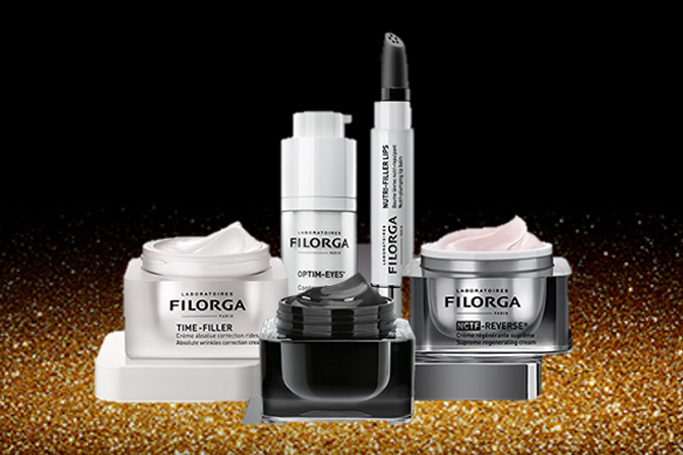 We highly recommend their Filorga Optim-Eyes, or try the Philosophy purity cleanser for your face and eyes. You've no excuse not to indulge yourself with 3 for 2 on Lookfantastic for Black Friday. Not only that, but save an additional 5% OFF your 3 chosen items with the code CYBERX5 and save even more on Filorga products. The cutting edge French skincare line, known for their exceptional patented anti-ageing technology is now available at your fingertips on Lookfantastic. For Black Friday 2018, they’re offering 20% off Caudalie products – now’s your perfect chance to nab the fabulous Caudalie Beauty Elixir for yourself! PLUS if you use the code CYBERX15 you can avail an EXTRA 15% off your Caudalie items... Meaning you can save up to 35% in total on your Caudalie products! Thanks to its pure, awakening and skin-loving products, Pixi has a loyal worldwide following – and UAE fans can enjoy 20% discount off their favourite Pixi products this Black Friday. Not only that, use the code CYBERX20 and you can enjoy an EXTRA 20% off your favourite Pixi items - meaning you can save up to 40% OFF! For orders made within the UAE, delivery may take between 4 to 6 working days and is free for orders over AED 400. Customers are responsible for their own customs charges, but this should only be applied when the value of your purchase is above $269 or 1,000 Dhs and should be around 5%. For full details and shipping/delivery costs for other Middle Eastern countries, please click here.